Where In The World? Schuss! Oh boy! Schussing down the slopes for me! But wait…where I am? 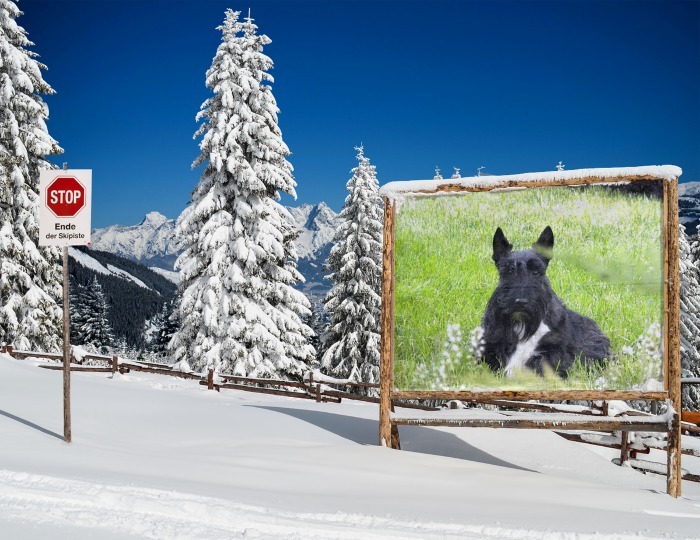 This entry was posted in Scottish Terriers, Terriers, The Scottie Chronicles and tagged dogs, pets, photography, skiing, travel. Bookmark the permalink. 31 Responses to Where In The World? Schuss! And that would be painful. The more you’re slip slidin’ away. I hate to slide. It makes my toenails hurt. How are you these days? My peeps and I think of you often. If you say so, it must be because I haven’t a clue. It’s a sure bet you’re not in the good old U.S.A.! Nope. I don’t think so…. My scottie girls, Bonnie and Raelinn were more likely to snowplow than ski down. They would just put their faces down and plow snow. They loved snow!! We are guessing the Black Forest in Germany, no? That sounds like a good guess! We hope that you brought your winter clothing. We don’t own any and we don’t want to own any. I’ve got two coats. They keep me nice and warm. It isn’t Arizona or California where nobody stops for stop signs. I’m thinking northern Newfoundland where they only have one stop sign and it is such a novelty that they actually stop for it. You are a fountain on knowledge. You’re on a mountain. We don’t get around much, so that’s the best guess we have. Happy schussing! And it’s a good guess! Sounds good, but I haven’t a clue. So sorry my pals. Can’t be around here ‘cos we only got 87 flakes of snow! I don’t think I’ve ever had chocolate.